Maersk cyberattack illustrated how an incident can start out- mental bill, which expanded the pool of eligible port applicants to side the U.S. and have a cascading impact on our ports and all entities covered by an Area Maritime Security Plan (AMSP). In the supplemental 2007 grant round, FEMA also transi- that future PSGP funding would be used for upgrading tech- tioned the second highest risk funding group to this collab- orative process. The remaining funding groups retained the nology, such as cameras and other surveillance tools. II port areas to develop a Port-Wide Risk Mitigation Plan. Since 2007, FEMA has focused funding on anything in a cal frst responders to respond effectively to soft target threats port-wide risk mitigation plan. AAPA believes there is a need such as an active shooter, emergence of high capability drone to focus funding on the original intent of the PSGP which was interception technology and an increased need for waterside focused on the maritime security plans. Prioritizing funding for security to protect energy transfer stations. 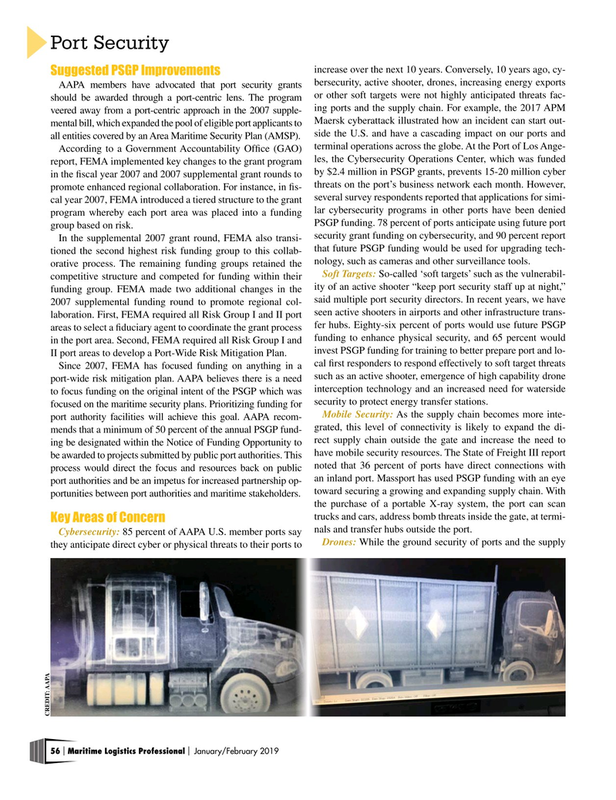 Cybersecurity: 85 percent of AAPA U.S. member ports say nals and transfer hubs outside the port.